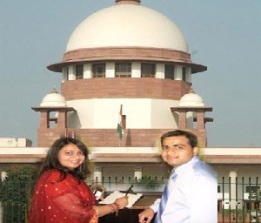 Welcome to Court Marriage, We are provindg court marriage services in across India. Our Services include Marriage in Arya Samaj Mandir, Arya Samaj Marriage, Court marriage or Marriage Registration services provided to all india. Marriage solemnised can be under the Hindu Marriage Act, 1955 or under the Special Marriage Act, 1954, Arya samaj marriage Act, 1937, court marriage is now a legal requirement in most of the states in India. Purposes a formal marriage certificate from the Registrar of Marriages is required. There are different rules and regulations for different religions. For example there are Hindu Marriage Act, Muslim Marriage Act, and Christian Marriage Act and for the Parsee there is Parsee Marriage. You can do your work successfully in short span of time with the help of our marriage centre. If planning to do a arya samaj marriage in India, then you are at right place. In Arya Samaj Mandir we will undertake the Hindu wedding ceremony, a rite known as 'sanskara', Arya Samaj Mandir has many components and it is quite beautiful, specific and filled with chanting, Sanskrit blessings and ritual that is thousands of years old. In India, it can last weeks or days. 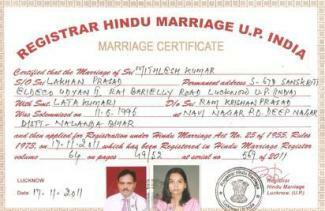 We help you in registration of marriage. With the help of our services you can apply for your marriage registration online.We ensure that most of the process of marriage registration is completed from the comfort of your home and without any hassles. 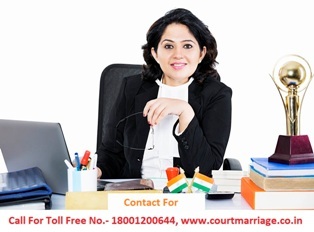 Our expert team sees to it that all documents to register your marriage are properly filled and filed. >We are at Court Marriage is prominent name when it come to Court Marriage, Arya Samaj Marriage and Marriage Registration in all over India. We are into this field since last 10 year. We have a dedicated team of Advocates who will help you in each and every step of your Marriage.